Organ Pipe Cactus Monument averages nine inches of rain per year, and experiences two wet seasons. The western edge of the park receives a little less rain than the Ajo mountain range along the eastern edge. During the months of April and June, Organ Pipe receives less than a half of inch of rain. In fact, a complete lack of moisture is often expected. In 1972 the park didn’t receive more than a trace of rain until the month of June. During wet seasons, the opposite occurs when an inch or two of rain may fall in a couple of hours. The dry, crusted floor of the desert moves flood waters quickly causing flash floods. These flood waters also tend to pick up a substantial amount of debris, which can include sand, rocks, and plant material. Debris is a frequent concern in flash floods because fires—which occur occasionally in the park—drastically increase the availability of damaged vegetation that flood waters can carry away. The United States Forest Service estimates that floods that occur after large desert fires can produce five times the quantity of runoff. While today these floods can devastate property, native people such as the Tohono O’odham have lived in relative harmony with the desert’s hydrologic cycles. To survive, these people chose carefully when and where they grew their crops by placing their fields where flood waters can wash over them. When they encountered a particularly dry wet season, they would not grow their crops. As a result, they planned ahead for seasons, or years, in which the desert would not produce enough rain to grow their crops. Today we do not use agriculture to take advantage of wet seasons. Instead, floods damage roads, houses, and threaten human lives. Consequently, any manmade structures should account for flood waters and the debris it carries. Manmade structures can also worsen the effects of floods. One example of this is U.S.-Mexico border fence in Organ Pipe Cactus National Monument. On July 12,2008, two inches of rain fell in less than two hours. As water ran off the desert and picked up debris, the pedestrian border fence acted as a dam, resulting in seven foot pools along the border. Instead of moving in its natural north-south direction, the water moved laterally across the fence and flooded Lukeville, which is the port of entry to the monument. 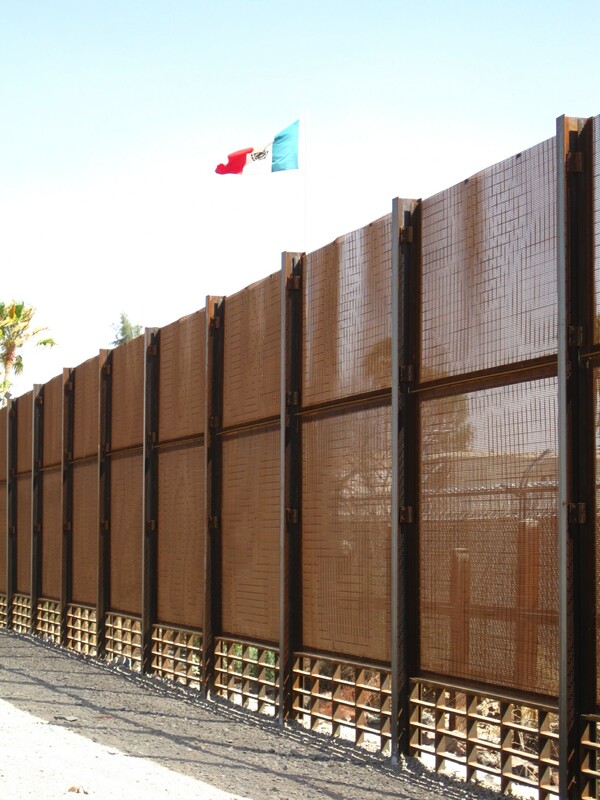 Covered in mesh panels, the fifteen foot tall fence has one inch bars that divide six inch high and twenty-four inch wide panels along the bottom. Engineers designed these panels to let water freely flow through. They knew that in order for the panels to work, debris would have to be constantly moved away from the fence. This however, proved impossible, and as a result the fence changed water runoff and failed to meet environmental standards set by the Army corp. The National Park Service issued a report in 2008 regarding flood damage in Organ Pipe which is caused by manmade structures. This report criticizes the designers of the fence and cites a number of problems the fence creates, including environmental factors. They found the pedestrian border wall and the patrol road near the border negatively affects Organ Pipe more than expected. The fence impedes the natural flow of water which disrupts plant life, and causes structural damage to nearby vehicle barriers, the patrol road, and the fence as well. As a response to this flood, in 2010 the Army Corp of Engineers tried to improve the flow of water by installing liftable gates in the drainage system. A similar flood occurred in August of 2011–one and half to two in half inches fell in a day–and the new gates in the drainage system failed to open. The fence once again acted like a dam: debris clogged the panels at the bottom of the fence. This temporary dam, once again caused the unnatural lateral movement of water resulting in the nearby port of entry, to flood. This time the fence could not hold and forty feet of fence washed away. Officials understood that this region could receive that much water. Richard H. Hill and William D. Sellers, Arizona Climate: 1931-1972 (Tucson: The University of Arizona Press, 1974), 60. Pima County Regional Flood Control District, “Past Flood Events in Pima Couny,” Pima.gov, http://rfcd.pima.gov/outreach/flooding/ (accessed April 10, 2012). Brady McCombs, “Rain Washes Away Forty Feet Of U.S.-Mexico Border Fence,” Arizona Daily Star, http://azstarnet.com/news/local/border/rain-washes-away-feet-of-us-mexico-border-fence/article_9eaead31-14eb-5474-a5c5-564a980049b2.html (accessed April 15, 2012). Associated Press, “Critics of Fence Point to Flood at Border Sites,” New York Times, August 26, 2008. under “U.S.” http://www.nytimes.com/2008/08/26/us/26fence.html (accessed January 29, 2012). Arizona-Vacation-Planner.com, “Arizona Stupid Motorist Law: Don Pay to Get Stuck in the Mud,” Arizona-Vacation-Planner.com, http://www.arizona-vacation-planner.com/stupid-motorist-law.html (accessed April 23, 2012). Arizona-Vacation-Planner.com, “Washes, Flash Flood, and Flash Flood Saftey Tips,” Arizona-Vacation-Planner.com, http://www.arizona-vacation-planner.com/flash-flood.html (accessed April 4, 2012).